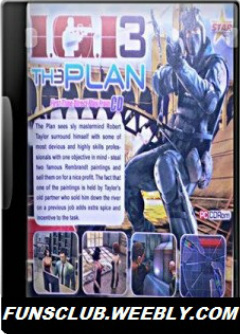 The Plan is not an IGI original first person shooter game. IGI 3 is developed by the third party. After IGI 1 and IGI 2 the IGI series is closed. As IGI 1 and IGI 2 is developed by Inner loop studios. After releasing IGI 2 - Covert Strike in March 2003 the Inner loop studios shuttered its door in June 2003. And now there is no chance that another IGI game sequel will be released. IGI game is the most famous game, The Plan is the very interesting part of the IGI game and this is very popular shooter game, IGI 1 & IGI 2 they are developed through Inner loop studios. But IGI 3 is developed through the third party. The plan is one part of the IGI 3. it is based on the igi im going in theme with a better graphical position and alot more new missions. Enjoy In this heist-based game titled The Plan, you play as Robert Taylor, ringleader of a gang of professional thieves out to steal two famous Rembrandt paintings. The first part of IGI game was not so popular but second part of IGI game very famous all over world IGI 2 is interesting version, also Project IGI 3 The Plan is very interesting and so many new features and changes include in this version. Project IGI 3 The Plan is best game in graphical design and shooter position and now no chance to released an other version of IGI because Project IGI 3 The Plan is interesting design very faster and easily to use.